Nothing in China is born equal. Cities weren't born equal and when they grow up, they definitely aren't equal. You have your famous big cities of course, your Beijing and Shanghai (municipalities, hierarchically speaking). They don't even have a province! And almost shoulder-to-shoulder you have a lot of provincial capitals that match them in size, such as Guangzhou. These cities boggle the mind - Guangzhou's urban population is over 11 million with a GDP 50% bigger than the whole of New Zealand, a first world country. Huge in every respect. Development blowing the mind at every turn. But further down we have another group of urban agglomerations: second tier cities. I'm writing this from Shantou, a Guangdong city up the coast, population 5.3 million. Three days ago I was in Zhongshan, population 3.1 million people. They have their own feeling and style unique from the big city ways. Naturally Qingyuan also fits this category but is now almost too familiar to me. Zhongshan is conveniently connected to Guangzhou via the newly constructed intercity light rail (200km rail with regular stops, took 40 mins to cover 66km). We were there for a wedding but it made a good chance for looking around too. In the district of Guzhen it was clear that it was lighting that powered the city's economy. Streets and streets of lighting warehouses. The light reading at our hotel was all about lighting. Many small towns tend towards an industry or a clear economic function. Of course me being me, the dialect caught my ear too. The dialect had some similarities to Qingyuan accent despite them being on opposite sides of Guangzhou but with a new diphthong, a different tone and a few reductions. Second tier cities tend to keep their accents. 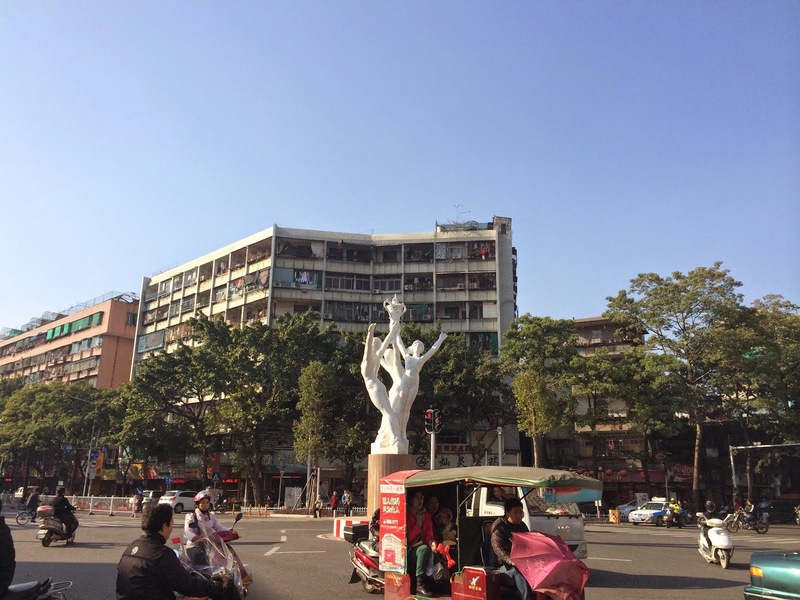 Shantou is one of the two famous Chaoshanese cities. Guangdong has three main Han Chinese cultures: the Cantonese, the Hakka and the Chaoshanese. The Chaoshanese languages (along with other Southern Min dialects) diverged at a very early time. It is almost unintelligible to speakers of other dialects such as Mandarin and Cantonese. It also retains many ancient features lost in other dialects. This may be true for the culture too. Mention Shantou to someone from Guangdong and the first thing they think is food. The place is home to a distinct and delicious culinary tradition. That is a prime reason we came. Beef balls, seafood, stewed goose, special rice noodle rolls (changfen) and a lot of other unique snacks are available here. Of course they're in Guangzhou too, for the most part, but nothing beats getting the most authentic version down any of the backstreets. Tea is big here, too. 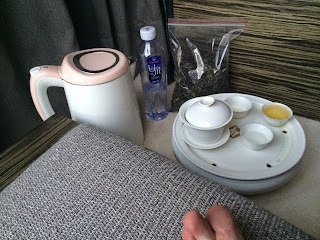 Apparently they drink more tea here than anywhere in China, and anecdotally, kungfu tea drinking originated in Chaoshan. This is a kind of tea set preparation and serving style that is akin to a ceremony. They have a tea set in our hotel room, which is a nice touch, and with the locally brewed Dancong Oolong tea I bought in a big bag I now enjoy tea the kungfu way. Just like Zhongshan the traffic is a feature again. Quick development, an ancient city, a ton of cars, motorbikes, jams and crazy driving. A second tier quirk is either the absence or unavailability of taxis, or their penchant for refusing to use a meter. Meters provide proof of transaction, thus require tax to be paid. And meters are objective and don't respond to the time of day. Both our rides yesterday were straight out quoted as 20 yuan. Our second ride had another interesting theme: We waved and the taxi rode up next to us. There was clearly a lady sitting in the front already but the driver while not completely stopping the car wanted to ask us where we wanted to go. We told him, agreed on 20 yuan, and got in. We assumed the lady was his wife or friend but a few minutes up the road she paid and got out. This is reasonably common practice the smaller the town is. Taxi drivers fishing for extra custom while serving another. We have another day and a half here and we'll look for more sights, sounds and food sensations.